This is our largest room located on the ground floor. With windows along one wall, the space benefits from plenty of natural light and is hired at a competitive hourly rate, making it an ideal space for your event. There is a lift to take you either downstairs to the kitchen or upstairs to other reception rooms and it benefits from having access to baby change and disabled toilet facilities in the foyer. This room is a fantastic space for the larger group. It is perfect for fitness groups, choirs, large seminars, family events and parties. It has a wooden floor and excellent sound system and a podium and stage can be hired by prior agreement. 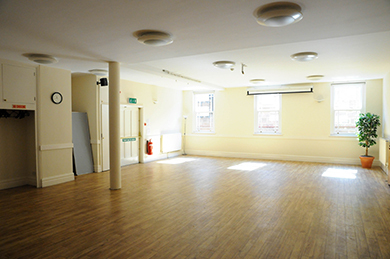 The room is mainly used for parties and large meetings but is versatile and can be used for other events. 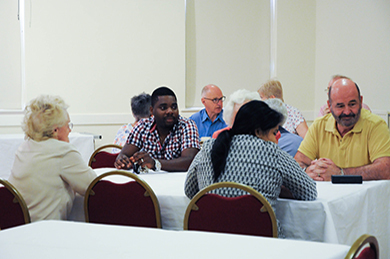 It has a maximum capacity of 80 people theatre style, 60 people boardroom style and can be linked up to the Ripon room next door by opening up the adjoining dividing walls enabling the capacity to extend to 100 people. 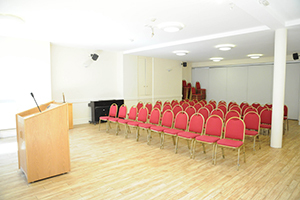 The York room has recently been used for an Asian wedding, Baptismal party, Fitness group, Choir and large conference seminar. We can provide catering and refreshments throughout the day and our on-site team are here to help with your personal requirements to make your event run as smoothly as possible.